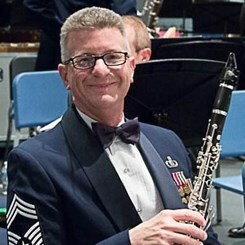 Over the course of a twenty seven year career with the United States Air Force Band, Carl Long served as Principal Clarinet of the USAF Concert Band and Symphony Orchestra. Carl has appeared in multiple recitals throughout the DC area and as a featured soloist on tour and at home with the USAF Band. Carl is currently principal clarinet of the Manassas Ballet Theater Orchestra and the American Symphonic Winds. He has recorded music for Alfred, Belwin and Warner Bros. Publishers, Walt Disney, Seaworld, Royal Caribbean and Norwegian Cruise Lines. Carl lives in Bowie, Maryland with his wife Dawn - a member of the US Navy Band – and their three cats: Taylor, Mya and Mitsy-Mittens.